"Howl if you like music. 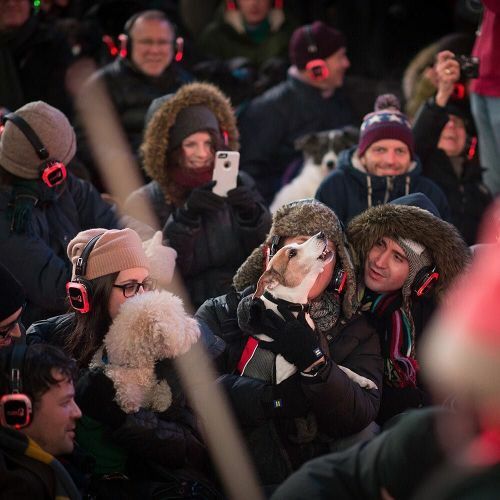 Jaxx, a Jack Russell Terrier, did just that at the end of a silent concert for #dogs last night in @timessquarenyc. The performance artist Laurie Anderson invited the animals and their owners to sit on the red steps of Duffy Square while she played low-frequency music that's pleasing to canine ears. Jaxx, 9, attended the show with his owners, Jeremy, left, and JD Morabito, who are pictured wearing headphones that allowed them to tune in. @nancyborowick, who photographed the performance, said many of the dogs seemed a bit confused by the howling. Only a few participated, "so humans were howling, too," she said. The performance was part of #MidnightMoment, a series in which #TimesSquare billboards become a fleeting digital art gallery. A 3-minute edit of Laurie's film #HeartofaDog followed the musical performance. #🐶🎻" By nytimes on Instagram.